Conventional wisdom holds that the next influenza pandemic virus will likely emerge from either birds or pigs, and given the incidence and diversity of flu in those species, that still makes a lot of sense. But if we've learned anything about flu over the past couple of decades, it is how unpredictable it can be. Increasingly researchers have been looking at other host species as possible sources of novel flu strains, and over the last decade we've seen reports on influenza in seals, bats, camels, skunks, and even companion animals like dogs and cats. Our understanding of flu's ecology and evolution in these hosts is extremely limited - even for dogs and cats - which have the greatest contact with humans. The relatively short history of canine influenza viruses (CIVs) began only a dozen years ago, when an equine H3N8 virus mutated sufficiently to jump to greyhounds at a racetrack in South Florida (see EID Journal article Influenza A Virus (H3N8) in Dogs with Respiratory Disease, Florida). A couple of years later, on the other side of the world, we saw an avian H3N2 virus also adapting to dogs (see Transmission of Avian Influenza Virus (H3N2) to Dogs) in Korea. Analysis showed that the HA and NA genes of the A/canine/Korea/01/2007 (H3N2) isolate were closely related to those identified in 2003 from chickens and doves in South Korea. Up until last year these two canine influenza subtypes stayed pretty much in their own backyards; with H3N2 circulating widely in Asia, and H3N8 in North America. While neither of these canine flu viruses have been found in humans, both continue to evolve and both belong to the same general subtype as viruses that have caused human flu pandemics in the past (H3N2 in 1968, H3N8 in 1900). 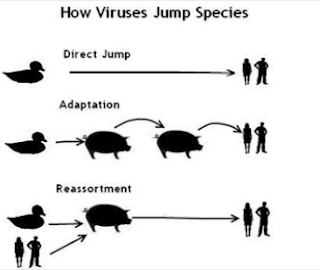 However, influenza viruses are constantly changing and it is possible for a virus to change so that it could infect humans and spread easily between humans. Human infections with new influenza viruses (against which the human population has little immunity) are concerning when they occur. Such viruses could present pandemic influenza threats. For this reason, CDC and its partners are monitoring the canine influenza H3N8 and H3N2 viruses (as well as other animal influenza viruses) closely. In general, canine influenza viruses are considered to pose a low threat to humans. PLoS One. 2016 Jul 14;11(7):e0159106. doi: 10.1371/journal.pone.0159106. eCollection 2016. Seroepidemiological Evidence of Subtype H3N8 Influenza Virus Infection among Pet Dogs in China. Zhou P1,2,3, Huang S1,2,3, Zeng W1,2,3, Zhang X1,2,3, Wang L1,2,3, Fu X1, Li S1,2,3. The H3N8 virus and the H3N2 virus are the main subtypes of canine influenza virus (CIV). H3N8 CIV mainly circulates in America, and H3N2 CIV mainly circulates in Asia. However, there was an outbreak of the Asian H3N2 virus in the United States (US) in 2015. Thus, it is important to evaluate the presence of subtype H3N8 virus in dogs in China. From May 2015 to November 2015, 600 sera from pet dogs were collected from Guangzhou, Shanghai, Beijing and Shenzhen for hemagglutination inhibition (HI) assays and microneutralization (MN) assays. Fifty-two (8.66%) of the 600 sera were positive for the subtype H3N2 virus, which matched the previous reports. Five (0.83%) of 600 sera were positive for the subtype H3N8 virus (H3N8 EIV or H3N8 AIV or H3N8 CIV), which is the first report of subtype H3N8 virus infection among dogs in China and remind us to play more attention to this subtype virus. Therefore, further serological and virological surveillance of influenza virus infection among dogs in China is imperative. There was some ambiguity in the cross reactive testing for H3N8 (as described below) making it impossible to fully differentiate between H3N8 equine, avian, or canine strains. Ultimately, using cutoffs of HI ≥1:20 and MN ≥1:80, 5 specimens were positive for equine H3N8 virus, and 3 specimens were positive for avian H3N8 virus which is also positive for equine H3N8 (Table 2). One of these five H3N8 positive specimens had both subtype H3N2 virus antibody and subtype H3N8 virus antibody (Table 2). Additionally, HI assays were conducted to evaluate the cross-reactivity between these viruses. There was strong cross-reactivity between H3N8 EIV and H3N8 AIV, and no cross-reactivity was observed between H3N8 EIV or H3N8 AIV and H3N2 CIV (Table 3). 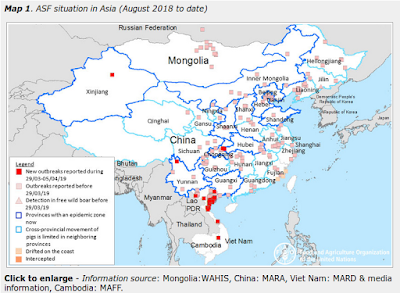 All of which means they can't tell if North American canine H3N8 was imported into China, or if avian (or possibly equine) H3N8 jumped species barriers to infect dogs in China, as we saw with avian H3N2 in Korea a decade ago. What we do know is the H3N8 subtype is part of the mix of influenza viruses that circulate in China's canine population. Given H3N8's long history of jumping species (to seals, camels, horses, canines, and humans) and reports of other novel flu viruses circulating in dogs, the idea that canines might serve as potential `mixing vessels' for flu isn't all that far-fetched. So while we primarily monitor birds and swine for emerging flu viruses, we can't discount the possibility of being blindsided by something coming from another host species.